If you can write Spanish, and more importantly, you live in Spain or Portugal (as the organizer would send the prizes to the winners to these countries only), you might like to look up this link for details for the Extremauran recipe competition. The prizes are awesome. Even if you don't intent to take part, what about go taste some of their world-famous ham (Jamón Ibérico) or other pork products from the region if you have a chance? For me, it is the best! What impress me even more, the pigs are left to roam in relative freedom and their main diet is acorn falling from local oak tree. 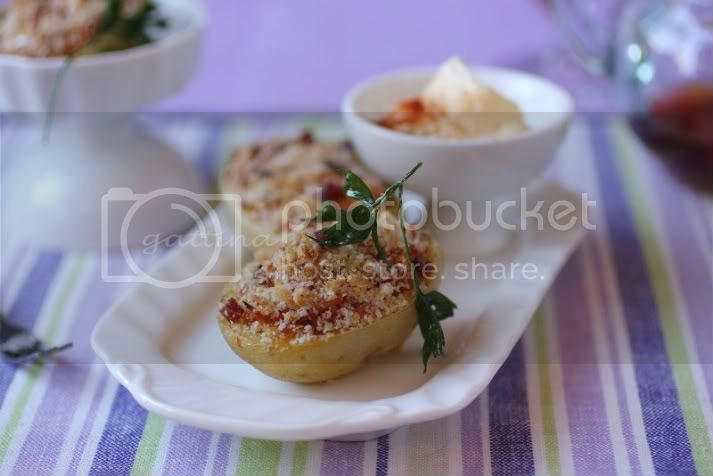 I have just finished one entry, the idea of my dish is derived from potato skin this popular starter. That looks delicious. Great shot! This really looks elegant, lovely. G, how do you do it so nicely without tearing the potato skins? I tried once and I gave up after 3 unsuccessful attempt.